So as the days get shorter and there are less sunny events to attend, when we are not responding we start to focus on other ways to support our community. We rely entirely on donations to pay our activities and raise funds through high street collections and sponsorship by local businesses and groups. Each day, approximately 170 people in the UK suffer a Sudden Cardiac Arrest (SCA). Good CPR and early defibrillation within the first few minutes can save up to 75% of all SCA's. Our mission to is train as many members of the public to carry out CPR and potentially use and AED whilst waiting for an ambulance. 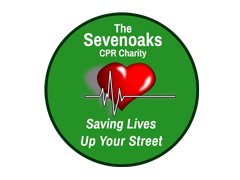 Copyright © 2019 Sevenoaks CFRs. All Rights Reserved. Design & Development by JCS Creative.